when the frozen food section at the grocery store is warm. so maybe january wasn't the best time of year to move to new york city, but i guess we're gluttons for punishment. it's love...I'm certain. the apartment looks so perfect for you. I never did go to the Creer's...but she is darling, so I'm sure her apartment is as well. Deep breaths for at least 2 weeks. It'll be great! Erin.. your apartment/house? is awesome! 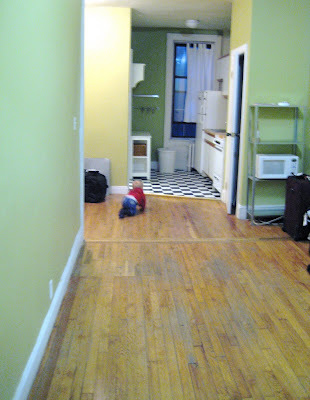 I love the green walls and the checkered kitchen floor! Good luck un-packing! Congrats on the move! Did some of your stuff get stolen? I hope not! Dang movers. Keep us posted! I am so jealous New York is my dream- I am sure that you will have an amazing experience. no one knows cold until they have lived thru one east coast winter. we had an elder get his contacts frozen to his eyeballs. What an experience. I'm a tad jealous. & more than a tad jealous of your fabulous red boots. Such style you have. welcome home, burtons. the apartment looks way fetch. i heart the checkered floor. oh i miss you guys and little foxy. your apartment looks darling. glad to finally see some pics, i've been waiting for a post. so you made it and you like it, eh?? That's good. It was rough for me in the beginning so it sounds like you are adjusting fine. We'll be back on the 11th or somewhere around then. I can't wait to see your place. i don't know. maybe lust. there's nothing like the big apple. btw, love your red boots! you're a doll and so is foxxy. he's ginormous, erin. we miss you guys, but we may be back in june... wouldn't that be lovely. happy new year, gg. also, i LOVE your apartment!!! the wood floors, checkered tile, brick wall, classic. yay! you made it! what a cute little snuggle bug you have. just cuddle him close when you get cold. your place looks really great. so your apartment is fabulous and i love the cozy photos of you and mr. foxlove cuddling. it just looks perfect! oh and so you know. black and white checkered flooring really melts my heart. i always love that and brick walls. i think i might have too move in. Ah you made it! Yeah! Thankfully the other things did as well. Stay on top of that sleep. Looks like it is well needed. I am excited to hear about the NY adventures. How fun! Moving is such a pain. It looks like you are going to love it there though. I wish I could have seen Fox and you before you left! ok. first things first ... that picture makes my heart melt. sweet baby boy. i could just eat him up. secondly ... what happened to your stuff? it's not gone forever is it? thirdly ... so glad you're there. although it's cold it sounds like it's not disappointing either. lastly ... is it bad i miss you already? YEA!! So in prep for your arrival I have planned a trip to visit with you and see this posh apt. I hear your apt was a hot commodity in the ward ;) good snag! I will be there on the 19th dragging two other friends with me, can't wait to see you!! welcome to the EAST, upper east that is! well, looks like your cute little snuggle-buttons will keep you toasty. and your new digs look fab! i'm glad you made it to the york safely! little foxland looks tuckered out in that picture. so cute...give him kisses!!! I'M in love!! Can I move in? Just kidding....but seriously, it looks fun! You were made for NYC, E! 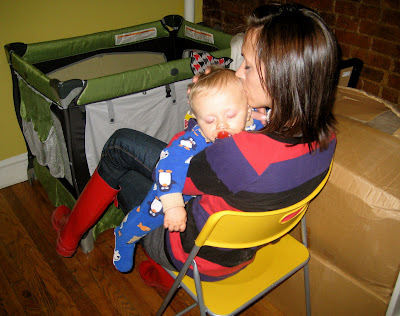 Pac-n-play beds, ikea folding chairs as a makeshift rocker...I feel ya girlie. Hang in there! Spring is amazing in central park and it's just around the corner. Just think Cherry Blossom festival in DC! awwwww... how incredibly sweet. I bet it feels roomy in that kitchen after Hong Kong! ah! your boots!! : ) kindred red-boot spirit.